When you don't know what to cook, yet, you feel its better to cook instead of dwelling on the battle where we should have our meal with the family? 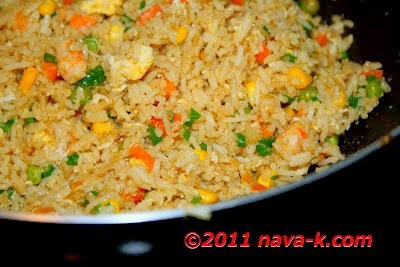 For a fact, fried rice most probably can show you the way to what you should cook? For me personally, yes. 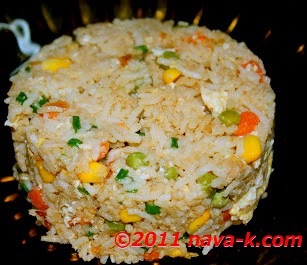 (Kampung Fried Rice & Belacan Fried Rice). Fried rice and this Chinese Fried Rice? Leftover cooked white rice, garlic, prawns, dark soy sauce and spring onion garnished? Your meal. For breakfast and right up to supper. When oil is heated, fry garlic and prawn for a min or two. Add rice, veggies, dark sauce, sesame oil, pepper and salt. Stir to combine all the ingredient. Quickly and in a jiffy. Push rice aside and break eggs in the center. Very gently fold over rice and stir. Off the heat and stir in spring onion. This is a different style than what we usually try. Tengok makanan ini...perut mula berbunyi...nak jugak! thanks all for the great comments. Recipes can be modified to suit your taste too. love all your comments, thank you everyone.